Protein Powder Ice Cream has been around for awhile. The recipes I've developed, however, are my own - original to me. There are all kinds of fun combinations you can make! I use extracts freely, as they add tons of flavor without changing the nutritional profile of the ice-cream. 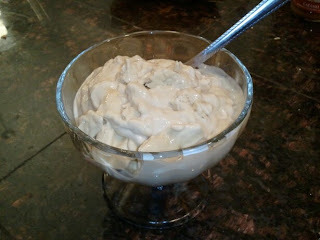 Creamy and amazing, I even enjoyed my protein powder ice cream nightly while I prepared for my Figure Competition! If you can make a protein shake, you can make ice cream! There are two ways to make this... the first is in an ice-cream maker, the second in ziploc bags. I use a Cuisinart Ice Cream Maker I just blend my ingredients, turn on the machine, pour it in, and 20 minutes later I have ice-cream! Back in junior-high, we made ziploc ice-cream... where you put ice and salt in a big bag, and your ice cream ingredients in a smaller bag, then the small bag goes in the big bag (sealed of course), and you shake... voila! ice cream! Fill a gallon size ziploc bag about 2/3 full of ice. Add 1/2 cup table salt (don't waste good sea-salt on this, use the cheap iodized stuff, it's only to make the ice colder). Pour your ice cream mix into a sandwich size ziploc bag & seal it. Place the ice-cream bag into the larger bag. Seal. Shake for about 5 minutes or until ice-cream reaches the consistency you prefer. Remove the inner bag and quickly rinse it off (so you don't get salt in your ice cream when you open the bag). Dump ice-cream into a bowl and enjoy! ► BLEND your ingredients before putting in the ziploc or the ice-cream maker. 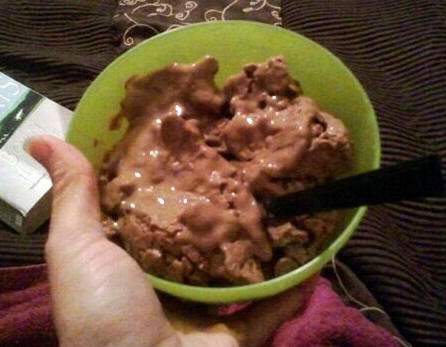 ► SCOOP SIZE... My protein scoop = 1/3 cup. Measure yours, as volume will matter in these recipes. ► Nutrition data will be dependent on your protein powder & ingredients. Any numbers listed here reflect my protein powder/ingredients. You can use NutritionData.com to run your own numbers (it's free!). ► Substitutions... you can sub water for the almond milk (or coconut milk, rice milk, soy milk, etc) if you need to. Calories: 182; protein: 21 g; carbs: 7g; fat: 7g; sodium: 350 mg; sugars 2g; fiber 2g. In a blender or magic bullet, blend the almond milk, protein powder, and capella drops (if using) until smooth. Pour mixture into ice cream maker and turn on. 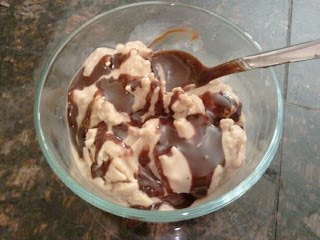 After 10 minutes, add 1 Tbsp caramel syrup, drizzling in to mix with the ice cream. Run for 10 more minutes or until ice cream reaches desired hardness. 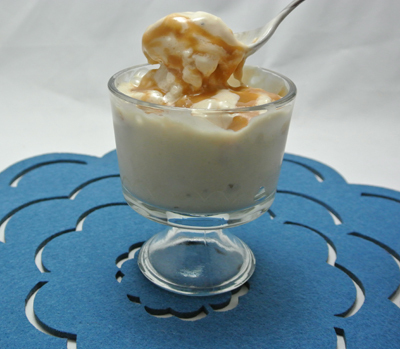 Remove ice cream to bowl, top with remaining 1 Tbsp caramel and sprinkle on the sea-salt. 235 calories, 31 g protein, 8 g carbs, 8 g fat. Blend well, then prepare in either ice cream maker or ziploc method. You can adjust the strength of the green-tea flavor by increasing or reducing the amount of powder. If you're sugar-free, simply eliminate the honey, or replace it with stevia. 1 Tbsp natural peanut butter. 1 tsp decaf instant coffee crystals. In a bowl, combine the diced apple, butter, vanilla & spices. Microwave in 30 second increments until apples are soft. Stir. In a blender, combine protein powder & almond milk (and stevia if using). Blend Well. Mix protein powder/almond milk with apples and stir. Add to ice cream maker or prepare with ziploc method. Blend all ingredients well (I used a Magic Bullet), then pour into ice cream maker and run for about 20 minutes. YUM!! The strength of the apple cider flavor was awesome and when I added caramel, even better! TIPS... Add sugar free caramel syrup! After you've put it in the machine, let it run about 10 minutes then add 2 Tbsp caramel syrup to the mix an let it go. And/or drizzle caramel over the top! 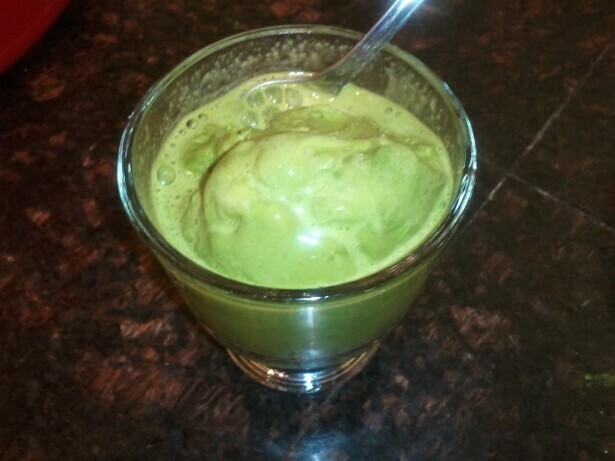 Blend well (I used a Magic Bullet), then pour into ice cream maker. Let it run about 20 minutes, then serve! I added sliced banana and sugar-free caramel syrup. You could add some instant coffee crystals to your mix for a mocha flavor, too! Nutrition: (just the ice cream) per serving: 183 calories; 29 g protein, 6g carbs, 5g fat, 2g fiber, 2g sugar, 259 mg sodium. I forgot to grab my camera right away! Oops! 1 tsp vanilla (pure) extract. Place blueberries in a sauce pan with the water and cook over medium heat until reduced down to a "syrup" (about 10 minutes). Remove from heat and add vanilla (pure) extract. Stir, and set aside or refrigerate until needed. 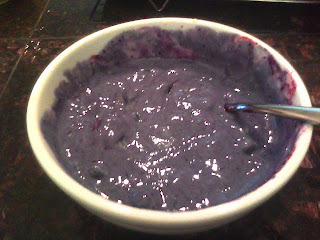 Add about half of the blueberry sauce, reserving the rest for topping. Blend again, just until the color spreads through the mixture. Add to ice cream maker, following manufacturer's instructions. Mine takes about 20 minutes. Scoop ice cream into a bowl, top with reserved fruit syrup and enjoy! FYI... you can do this with any fruit! Sub out the blueberries for whatever is in season or handy! Nutrition: 246 calories. 24 g protein, 19 g carbs, 9 g fat. Top with your favorite sugar-free chocolate topping if you like. Blend ingredients until smooth, then add to ice-cream maker or use the ziploc method in my other Ice Cream Recipes.